The Golfers Club membership includes a Fairway Member's Golf Pack, providing great benefits for golfers, such as the free rounds of golf at prestigious golf courses and premium golf insurance. 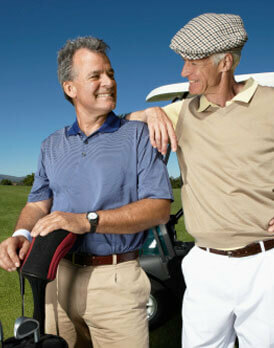 Any golfer 50 years old or older also receives a guaranteed 10% discount off the price of The Golfers Club membership. This will be applied in the payment area. So for example, if you select the Bronze insurance option for your membership at £47.99, when you come to pay you will see a discount applied of £4.80 and you will pay just £43.19. Golfers Accidental Damage Next time you damage a car in the club car park or break a nearby window your policy will protect you against such eventualities. No policy excess applies. Why choose The Golfers Club? Our insurance has been trusted by tens of thousands of members since 1998. All members receive a ‘Fairway Member’s Golf Pack’ when you join and if you renew, we’ll give you a brand new pack as a loyalty bonus. We make it extremely easy to take out a policy. We don’t ask you to specify your equipment, we cover it all up to the value you choose. Other insurers can ask you to specify equipment but if you miss something off your list or buy new equipment and forget to add it on then you won’t be covered. We have had countless number of golfers switch to us for this reason when they have had a claim turned down. New for old when replacing equipment as a result of theft, loss or damage is standard regardless of age or condition even for our Platinum policies which provides cover up to £5000. We cover your equipment in the car, at the golf club, at home or at work, 24 hours a day, as standard. There is no single article limit for golf equipment claims. Injury to a third party or damage to property is a golfer’s biggest financial risk. In today’s litigious society we think £5million Personal Liability should be a minimum requirement. Play golf abroad? Worldwide cover is available as standard on a Platinum Policy or a £10 worldwide upgrade option is available on our Bronze, Silver or Gold policies. So you don’t have to have worldwide cover if you don’t want. If your equipment is lost or stolen (a common occurrence when travelling) you can hire equipment and claim for it. Our Personal Claims service will get you back on the course quickly. Personal accidents, such as being hit in the mouth, are more frequent than you might think, so we provide cover up to £50,000 across all policies. Personal injury can result in your club membership going unused, so we provide club subscription reimbursement up to £1000 to protect against this. If you’re lucky enough to get a hole-in-one, then celebrate because we’ll pick up the tab. Most insurance has an excess but ours is just £50 for Golf Equipment and Dental Treatment and this can be waived by paying only £7 per year. Liability claims when using your buggy covered as standard and upgrades are available if you own your own buggy and need cover for theft and damage. This is a summary of why we think you should choose us. Of course as with all insurance you should read your policy wording carefully. Please note that the above is a brief summary of cover and should be read together with the full policy terms, conditions and exclusions, which are detailed within our Important Documents page. Insurance cover is available to residents of Great Britain, The Isle of Man, Northern Ireland and The Channel Islands, and is subject to the laws of England and Wales.